Izuna: Legend of the Unemployed Ninja, known in Japan as Gōma Reifu Den Izuna (降魔霊符伝イヅナ, lit. 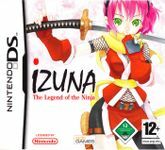 "Devil-conquering Soul Talisman Legend Izuna") and in Europe as Izuna: The Legend of the Ninja, is a Nintendo DS roguelike game by Success and published by Atlus USA in the United States, and by 505 Games in Europe. Source: Wikipedia, "Izuna: Legend of the Unemployed Ninja," available under the CC-BY-SA License.